EdLab MMU - Page 2 of 9 - Exploring Educational Innovation and Enterprise in Education - Creatively generating projects rooted in community engagement and student experience. This entry was posted in Blog, Environmentalists, Funologists on 30th November 2016 by mick. This session as designed to give back and a bit involve students in a community targeted workshop on digital skills. This entry was posted in Blog, Environmentalists, Spark The Change on 23rd November 2016 by mick. Sharing books with young children is known to be one of the most enriching and educationally beneficial activities that parents can do with their young children at home. Shared book reading is typically associated with a parent and child sitting down snuggled together with a printed book. However, increasingly, printed books are being replaced with digital books downloaded on a reading device such as a tablet or Kindle, and in many families a quiet bedtime reading routine is becoming more akin to watching TV or playing a video game. This entry was posted in Blog, EdLab Opportunities, Funologists, Partners on 18th October 2016 by mick. Workshop Description: For this workshop, participants will be challenged to write and perform short sci-fi dramas featuring their very own prototype robots. They will invent and perform a dystopian future for Stockport whilst exploring Arduino physical computing. This workshop is aimed at 11-16 year olds. This entry was posted in EdLab Challenges, EdLab Opportunities, Funologists and tagged craft, design, experiential learning, hands on, play based learning, robots, Seymour Papert on 29th September 2016 by mick. This entry was posted in EdLab Challenges, EdLab Opportunities and tagged starlab, stories on 28th September 2016 by mick. EdLab MMU and Community Arts North West are working with Petrus Homeless project to support the Hidden Rochdale project, a highly interactive digital trail that will tell the hidden stories of Petrus homeless service-users. Their goal is to take the audience on a provocative and highly engaging journey through Rochdale to uncover digital artifacts that will be concealed in the landscape. Developed by the Petrus Community working in partnership with Community Arts North West, the project uses writing, spoken word, music, video, animation and mobile technologies, and will culminate in an interactive digital trail that will take the audience on an engaging and creative journey through Rochdale town-centre in 2017. This entry was posted in Art in Action, EdLab Challenges, EdLab Opportunities and tagged community art, creativity, digital skills, playful approach, story trails on 28th September 2016 by mick. This workshop is supported by EdLab as part of the 2016 Brooks Community Learning Festival. This entry was posted in Art in Action, Community Learning Festival, Widening Participation on 7th July 2016 by mick. Programing so that we can control the different instruments to start and stop at different times via Arduino. This entry was posted in Blog, Community Learning Festival on 5th July 2016 by mick. This workshop is part of the Community Learning Festival at Brooks MMU Hulme taking place from the 26-28th July 2016. This entry was posted in Blog, Community Learning Festival, Environmentalists on 30th June 2016 by mick. This entry was posted in Blog, Community Learning Festival and tagged environment, rap, tony curry, writing on 30th June 2016 by mick. The Place in Fallowfield is a multi use learning centre incorporating Fallowfield library. There are courses offered by the WEA and it is supported by local housing provider One Manchester. It is an inspiring example of the community and local businesses coming together to save a great local resource from the cuts. The Place is home to some larger events which showcase different opportunities available. One example of this is an upcoming event on apprenticeships in January. When people arrive at education events they may be nervous. They may not have had the best time at school or other education. They may lack confidence in seeking out new opportunities. Can you design an activity that can happen to support other events. Your mission is to help people gain confidence about learning and make a link to what they have already done. It might be full of familiar and friendly things and allow them to get involved in a fun way. At the end of visiting your stall, they should come away feeling positive about what they already know and ready to learn more. This entry was posted in EdLab Challenges, EdLab Opportunities, EdLab Sparks, Spark The Change and tagged adult learners, asset based approach, civic action, community venues, library, situating sefl on 29th June 2016 by mick. The festival is a celebration of the diversity of learning happening in the local area. It’s a chance for community learning providers and University projects to come together and enjoy the facilities at the Brooks building for a series of lively and interesting events. The festival will have a range of activities, workshops, walks and talks over the three days. Each day features workshops on themes like democracy, care, community and the environment. Most importantly, there is always something going on for all ages and interests. 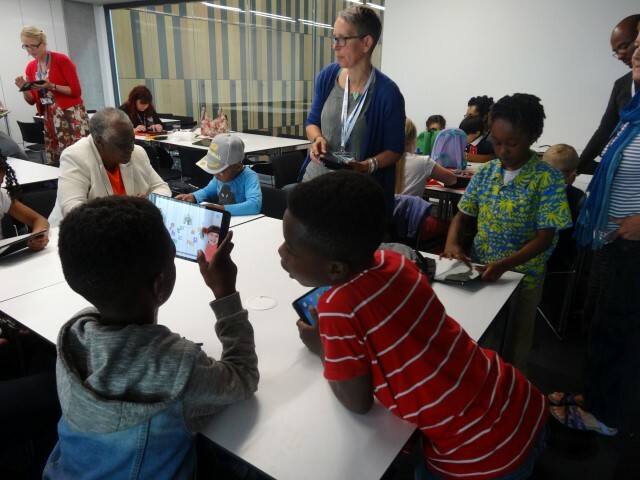 The Festival has been organised by the Manchester Met Faculty of Education in association with community partners including Louise Da-Cocodia Education Trust, Hideaway and Hulme Community Garden Centre. This entry was posted in Art in Action, Blog, Community Learning Festival, Environmentalists, Funologists, Partners, Spark The Change, Widening Participation on 29th June 2016 by mick. Mix-d is an organisation which works with young people who are mixed race to give voice to this underrepresented group. Mix-d have worked with this group over a number of years to hear and understand the perspectives of mixed-race young people, and as a result have created a number of packs to support professionals in working with these young people. Mix-d have offered to work with EdLab students to create a professionals pack to support primary school teachers working with mixed-race children. This pack would be the first of its kind in the UK, and could help teachers to work with mixed-race children in a positive manner which helps to develop a strong and positive sense of identity. This entry was posted in EdLab Opportunities, EdLab Sparks, Spark The Change and tagged education, Educational Packs, Identity Formation, mixed race, primary, Race, Social Enterprise, Social Justice on 28th June 2016 by juliette. The Proud Trust supports lesbian, gay, bisexual and trans young people in the UK. In 2013 Manchester’s LGBT youth group said there was a ‘gap’ in how they get and need support. The Proud Trust would therefore like to understand how a virtual community group could support young LGBT people and fill this gap for those feeling isolated from services. Research demonstrates the persistent disadvantage towards LGBT youth for example,within education due to homophobic bullying. Therefore, a virtual community group may do something to alleviate these issues for young people in education, and The Proud Trust would like students to investigate the potential. This entry was posted in EdLab Opportunities, EdLab Sparks, Spark The Change and tagged lgbt, online community group, support, virtual youth group on 28th June 2016 by juliette.